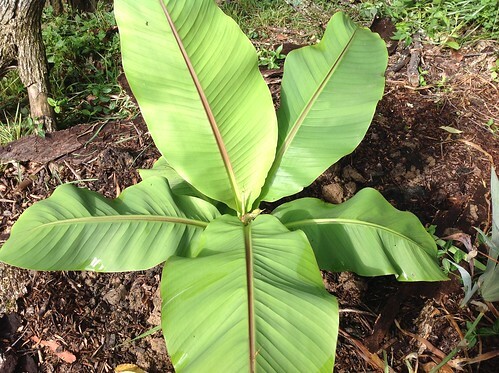 I planted this 3 foot or so Musa Basjoo in the ground about 2.5 weeks ago and after a week it started to throw up a new leaf. However, the leaf unfurled (as you can see from the attached photo) early and the stem still hasn't folded over much such that the leaf sides are pulled all the way back as if they would be drooping completely if the stem had folded over. It is growing at a crawl now, if at all, after shooting the leaf up at about 2-3 inches a day. I have clay soil so I dug a big hole and planted the banana in cactus/succulent soil. I water every day or every other day and when it rained I waited 2-3 days to make sure water wasn't collecting in the hole. Am I watering too little or too much? The leaf is not brown or yellow and the top of the soil did dry out a bit before I watered after the recent rain storm. The offset that came with it was planted in a pot in the same cactus soil and is growing like crazy with water every day (albeit it can drain as needed). I think too much water collecting in the hole. If you soil is heavy clay, then you need to build a raised bed (about 14 to 20") with about 60% sand & garden soil mix. This will let excess water drain out to the ground surface. The plant is probably just sorting itself in its new location. If the rootball was disturbed too much it will stress your plant a bit and slow or stop its growth. Give it another few months to grow into the hole with some new roots. The plant  will be fine once it gets settled. Pics are hard to judge distance. But how far from the fence is it. Remember this plant is huge. I have a 2nd year one and the canopy is 10' wide and it still seems little. I'm not sure where Missouri is but has the weather been nice in the high 70's-to 80's? Haha ... I don't either and I'm in Georgia. But I do know you can't get there from here. Not without going though Atlanta &/or Hartsfield airport. Missouri is somewhere down the road, over the big hill, and across the BIG River. It's been growing roots. Transplanting a big plant in July in Missouri is quite a feat. It's a wonder the thing is alive. I think the roots have been getting established. Once the roots are established, it will start pushing new leaves like the second one there. Growing nicely now, has really picked up it's growth rate the past few weeks. However, I have noticed very slight darkish markings on a few of the leaves and the pup has dark markings (maybe red) all over, as is shown. Is this not a Musa Basjoo? I'm going to be pissed if they sold me something else and I have to wait yet another year to get one established in my yard (I started one last year and it did not survive the winter, a single pup came up this spring but died after a few weeks). This a small basjoo pup. The underside of the leaf will also have a red iridescent look to it. I think you may have a DC. ... Since I haven't grown a Basjoo, I jusrt didn't know if they have wine marks when little. And from all the pictures that I could find, they don't appear to. Since your interest is in ornamental banana, I recommend you feed it fish emulsion and nothing else.